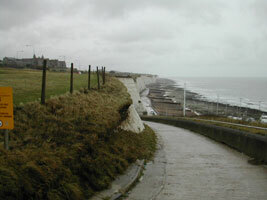 The main geological interest on Brighton & Hove's coastline are the chalk cliffs to the east of Black Rock. The cliffs are visible from behind Asda in the Marina all the way to the River Ouse at Newhaven. The cliffs are designated a Site of Special Scientific Interest (SSSI). There is an information board at the foot of the cliffs at Black Rock. The site is managed by the council. As the cliffs are designated a SSSI the agreement of Natural England must be received before any work is carried out that may have an effect on them. Of particular interest is the section at the western end immediately behind Asda. Here the chalk changes to a sandy material containing an ancient 'raised beach'. 'The Black Rock Raised Beach is an exceptional geological section preserved in the cliffs behind Brighton Marina. It comprises one of the most extensive sections of ice age geology visible in Northern Europe and represents an exceptionally important part of Brighton and Hove’s natural resources. Through an understanding of these cliffs, made possible through almost 200 years of observation and research, it is possible to reconstruct long-term climate change and sea level rise spanning a period of a quarter of a million years. The site also preserves a rare find of early Neanderthal archaeology in the region. Inspection of the cliffs at Black Rock will reveal they are not composed of solid chalk like those to the east along the East Sussex Coast, but comprise chalk and flint rubble resulting from cliff collapse and brown, sandy water-lain sediments washed down the Whitehawk Valley. These deposits were laid down under two phases of extremely cold conditions when the earth was in a phase of prolonged global cooling. However, below these cold stage rubbles can be seen a bed of rounded flint gravel identical to that you might find on the beach at Brighton today. Yet, these pebbles were laid down between 200 and 250 thousand years ago and are now some 8 - 10m above modern sea level. They were laid down during a phase of global warming around a quarter of a million years ago and have been elevated to their current height above sea-level through long term uplift of South East England as a result of tectonic processes. These gravels and others surviving beneath the Sussex Coastal Plain between Brighton and Chichester form a record of changing environments over millennia. They are known as Raised Beaches and can be traced running inland parallel to the modern Sussex coast. The Brighton Raised Beach can be traced through Kemptown, Hove, Worthing and then on to Portsmouth as an extensive spread of sands and gravels overlain by inter-tidal silts and occasionally preserved landscapes. They are often associated at Black Rock and elsewhere with the bones of horse and mammoth. However they are generally quite deeply buried and so the Black Rock cliffs provide a unique visible exposure through these sediments. The Black Rock section was first described in 1822 by the geologist Gideon Mantell who discovered the fossils of extinct mammals within the chalk rubble which he subsequently called the ‘elephant beds’. 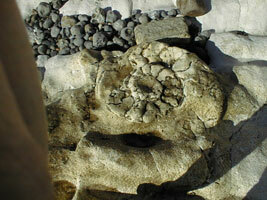 Remains of mammoth, woolly rhinoceros, horse and bison have been recovered from the rubble and whale remains and mollusc shells were found within the raised beach itself. A flint tool, interpreted as a hand-held butchery knife or ‘biface’, was also found on the surface of the raised beach. Given its form and age it was almost certainly left here by Neanderthal hunters as much as a quarter of a million years ago. The chalky rubble layers can be seen to bank up against solid chalk to the east, this being the line of the original sea-cut cliff. Also at Black Rock a cross-section through the Whitehawk Valley can be seen. This preserves more recent deposits from the cold stage which ended around 10,000 years ago. Small depressions of darker material at the top of the cliff, immediately below the topsoil were formed during the depths of the last cold period as much as 20,000 years ago. 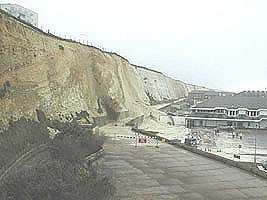 'This coastal site comprises the length of chalk cliff stretching from Black Rock in the west to Castle Hill, Newhaven in the east and includes the wave cut platform at the cliff base. 'The wave cut platform is worn into a characteristic pattern of gullies and ridges at right angles to the sea and supports a variety of typical invertebrates and algae. The cliffs provide the best and most extensive exposure of the offaster pilula zone in England. The gentle folding and superb accessibility of the base of the cliff make this an important collecting site for f-unas of the upper santonian and lower campaign. It is a nationally important reference section for the upper cretaceous. 'Chalk muds and fine chalk gravel and grit are banked against the rubble on the west and may represent fan deposits. The muds contain appreciable quantities of loess and are overlain by further coarser solifluction deposits. The chalk rubble and solifluction deposits are particularly notable for their fossil remains and many Devensian mammals including elephas primigenius, tichorhinus antiquitatus and equus caballus. The landforms, stratigraphy and mammal remains at Black Rock provide an extremely valuable record of former sea levels and changing environmental conditions.